When a man who has been declared legally dead reappears and attempts to gain control of his dying wife�s millions, her family rallies against him. This results in one murder and a call for Perry. Continuity: In an early view of Perry�s desk, his intercom box is missing. Later, it�s back. See here. Submitted by daveb, 11/29/2007. Sightings: First, Quiet Old Man #1 peeks through the audience in the courtroom gallery. Second, �Miss Carmody� is visible in cutaways to Clarence Henry (Max Showalter) when the hearing reconvenes. Learn more about these familiar faces, and help us spot others! Submitted by g, 1/30/2011. Max Showalter had recently reclaimed his birth name; after signing with 20th Century Fox in the '40s, he'd been persuaded by the studio to change his name to the more "bankable" Casey Adams. Submitted by francis, 6/8/12. Perry finds a MOVIE CAMERA hidden in a flower pot in the murder room. The camera looks like a 1950's Revere 8mm Cine Zoom with Wollensak lens. The close-up shot at 22:06 shows the camera's film magazine wide-open and empty. "Revere" and "WOLLENSAK" were the "budget" and "premium" brands of essentially the same camera made by the same company (Revere); see story & collector's page. Added by Gary Woloski, 9/13/13. Only ONE CAR but there's not enough of it visible for absolute identification. After leaving the murder scene, Perry (in driver's seat) and Paul (passenger seat) sit in a convertible while discussing the missing film (23:37-23:55). Only a corner of the windshield, vent window and bit of the interior is seen. TBird, Lincoln and other makes can be ruled out but what is shown corresponds closely to any 1960 -1963 Galaxie convertible. Based on the context of past episodes, this car is probably Perry's (old) black 1962 Ford Galaxie 500 Sunliner (a new 1963 Sunliner for Perry shows up in Ep#178). The portion of the interior seen is the Left side aft of the driver's seat. If you'd like to strain your eyes further, here are links to '60, '61, '62 and '63 Galaxie interiors. 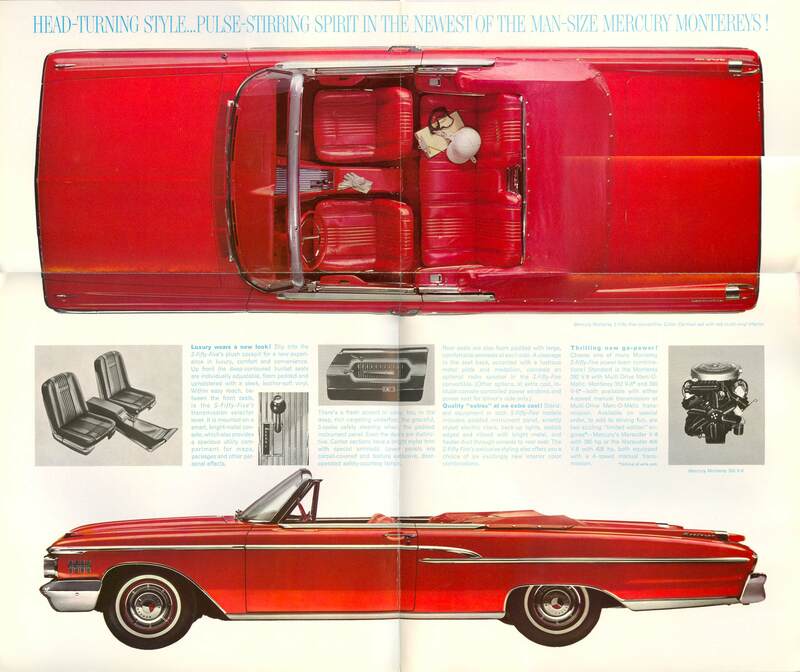 Since full-sized Mercury convertibles of those years had the same underlying design but with fancier trim, you should have a look at them too: '60, '62 Mercury. Added by Gary Woloski, 9/15/13. "A graduate of the University of Southern California School of Law, Morris Ankrum was an Attorney and Economics Professor before switching careers & joining the theater," IMDb observes, listing him as Judge in 22 Perrys (8.1%) from #3/"Nervous Accomplice" in '57 to "Sleepy Slayer" in '64. Mike Bedard 2.10.15. Another example of the domestic violence that goes unpunished in this series. Edgar slaps his wife in front of a witness because she mouthed off to him, and he bellows, �Take her out of my sight.� So, the witness does that, instead of calling the police and having him arrested for assault. Submitted by g, 1/30/2011. + Domestic violence, yes, but perhaps not so easy for the witness to call the police. See the scene starting at around 17:09 on the 2011 Paramount DVD. Nora, the witness, arrives at 17:41, and Edgar Thorne slaps his wife, Clara, at 17:47. ("Get her out of my sight," Edgar coldly tells Nora. I hope that this was a one-take scene.) Nora had been the housekeeper for Mrs. Billings, Edgar's niece, for 20 years, so she was likely aware of how and why the marriage of Edgar and Clara was disintegrating. Joy Hodges did have something to sing happily about, 27 years earlier. YouTube has a clip here of Joy, along with Jeanne Gray and Betty Grable, singing backup (about 1:10 onward) to Ginger Rogers and "Let Yourself Go" from Follow the Fleet. lowercase masonite, 3/2/16. + I think it is significant that the abusive husband is a man of bad character. His abuse of his wife is part of his overall nastiness. I could be wrong, but I don't recall any episode where a good or sympathetic character beats up women. In other words, just because domestic abuse was legal, the scriptwriters were not approving of it. They were using it to reveal his bad character. Submitted by JazzBaby, 04/02/2019. This strikes me as one of the better episodes, in part because of the complexity of character of Perry's client, Trevor Harris. It's a nice change of pace from the usual innocent-young-girl defendant, and I think that David McLean does a good job with the role. Ed Zoerner, 8/10/11. Those supposedly "infrared" images (both the movie and the prints) are bogus. They appear to be negative images from regular panchromatic film. Infrared images would not look like that. Evidently the producers, unable or unwilling to obtain true infrared images, were hoping to fool the audience by showing negative images made from regular film. And why not? I suspect very few people in 1963 had any idea what a true infrared image looked like. Submitted by 65tosspowertrap, 11/14/2013. The quote which Lt Anderson finishes, "There is some soul of goodness in things evil," comes from Shakespeare's Henry V. Ed Zoerner, 11/7/14. Bad/Deadpan acting: David McLean as Trevor Harris just says words without any emotion at all. He might have done better if he held the script in front of him and read it. ;-> Just my humble 2� of course. Submitted by mesave31, 04/03/15. TCOT Flawed Father I enjoy this episode a lot, but the end always makes me sad, when the runaway dad still refuses to see his kids. While I appreciate that this may be realistic, I am accustomed to the more usual happy endings! He had a lot of opportunity to grow in the course of this story, but didn't. Many hints were dropped about a potential romance with Jill, which would have given the children a stepmother and a father, but no. He runs out on them again and right after their mother has died. He really is deeply flawed and seems proud of it! Submitted by JazzBaby, 04/02/2019.